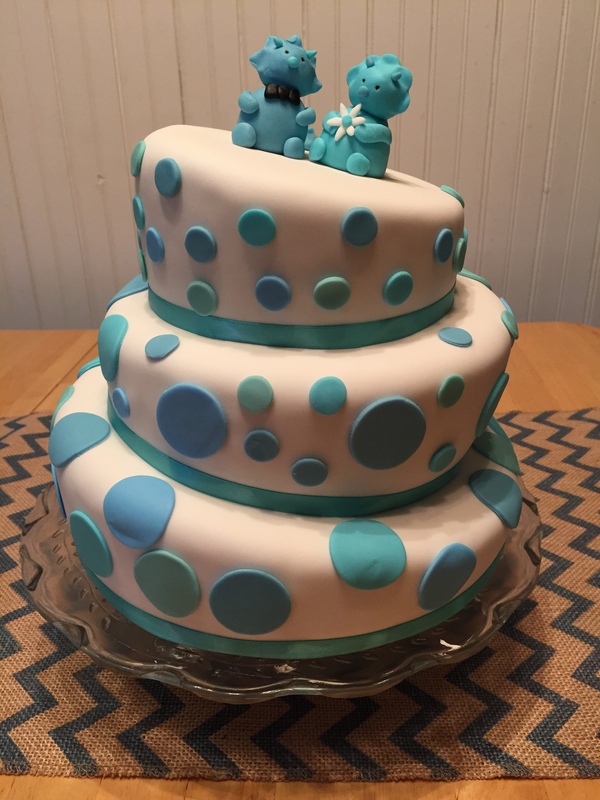 Here is Ken and Sonja’s official wedding cake – a topsy turvey cake with polka dots in Sonja’s wedding colors topped with adorable bride and groom dinosaurs! I think this cake came out really cute and was perfect for them! The cake is a brown sugar cake taken from the White Almond Sour Cream cake recipe (I simply replaced the white sugar in the recipe with brown sugar and replaced the almond flavoring with vanilla) and then iced with our favorite Basic Buttercream Icing. We covered the cake with Wilton White Fondant and then colored that white fondant to get the right colors for the polka dots and dinosaurs. We put a little ribbon around the bottoms of the layers to fancy it up for the wedding and ta da! Done! Love it, love the colors and they had a little dinosaur joke going when they were dating, so perfect! Congrats again to Sonja and Ken! Thanks, I love this one too!